Shhh. We have special offers just for our newsletter readers. Don’t miss out! Our favorite wine country chefs share their favorite recipes with us, so we can share them with you. Read insider stories and tips to discover WineCountry — from your sofa or on your way here. 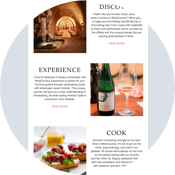 Our network of sites is dedicated to the adventure and romance of global wine country.